All hungry for money, the suggestion arises that they all play Rock, Paper, Scissors to decide which order they will all go in to see the daughter. Hilariously, Reign beats all of them. I mean, he’s in a room full of people who supposedly have psychic powers, and he out plays them all. Brilliant. From here we get him sitting down and talking to the girl, who spins a tail of her father being the evil one, locking up an innocent girl and treating her like a prisoner. Which nearly everyone in the room buys. Personally, I felt kind of smart for actually picking up on the logical inconsistencies in her story like Reigen does. After being outed as a real demon, we get a great montage of the various forms of “exorcism” the room full of “experts” employ, including cross dressers and furries. All to no avail. But even if they weren’t blindingly incompetent, Dimple gives some insight into the identity of this spirit: Mogami Keiji, a famous psychic from 40 years prior. While a media darling, he was also a government assassin, using his powers to go unopposed. Due to dealing with the living and the dead, and turning one into the other for so long, it twisted him, turning him into something else entirely. He started absorbing evil spirits to turn himself into an all powerful vengeful spirit, and use his powers to get revenge against the powerful people who manipulated him when he was nothing more than their tool. 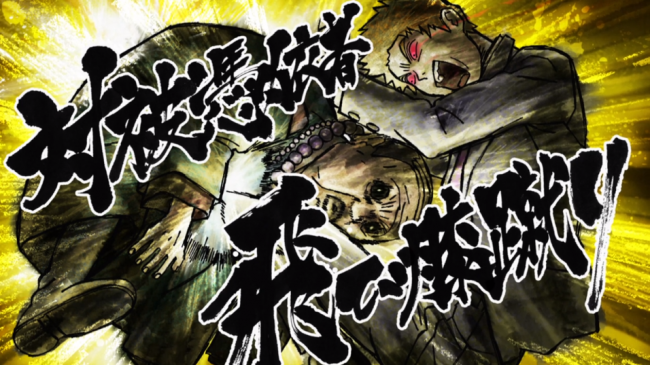 With all hell breaking lose, Reigen put himself in harms way by using one of his own “exorcism” techniques to save an old man, and gaining the wrath of Keiji. All this time, Mob finds it difficult to attack the spirit head on as it ends up using the body of the girl as a shield, showing little regard for her well being and making Mob hesitate. Mob’s only recourse is to leave his own body and enter that of the girl, expelling the spirit from within. 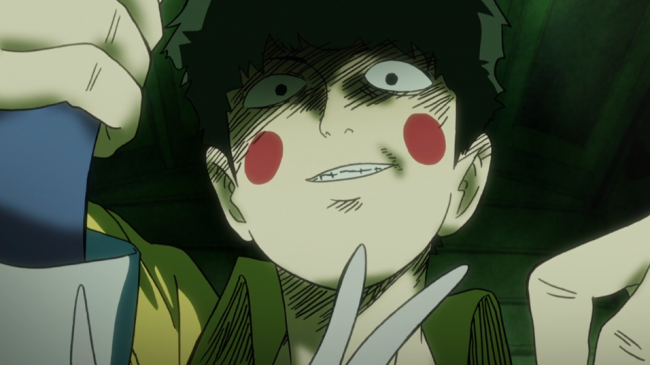 Leaving his body to be possessed by Dimple to defend it while empty, which was part of Dimple plan to steal Mob’s powers all along. Right now though, that seems like small potatoes as Mob find himself inside the mind of the possessed girl and still being overwhelmed. Keiji ends the episode by trapping Mob in a altered version of reality, one in which he cannot use his ESP… I have a feeling that this might not end the way Keiji is hoping it’s going to. This was another real good episode. 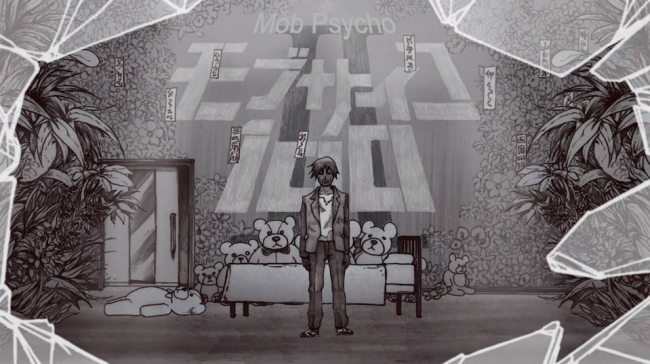 It continues down the path of Mob questioning his initial decision to not rely on his powers in his normal life by introducing a character who represents a potential final destination for Mob himself if just embraces his powers above all else. Another potential outcome is seen in Reigen, a man without any real psychic abilities himself, and yet he oftentimes seems to be the most competent person in the room. Because having great gifts in one area makes you lazy and incompetent everywhere else. It’s a continuation of the show’s apparent message that having great power doesn’t make you a greater person, in fact, in almost every instance it does the opposite. Mob is seemingly the only exception. Given Mob’s particular social stance in his everyday life, I feel like his life without powers torture isn’t going to have the intended effect Keiji intends. Which will probably show him a lesson about himself and lower his guard enough for him to be defeated. 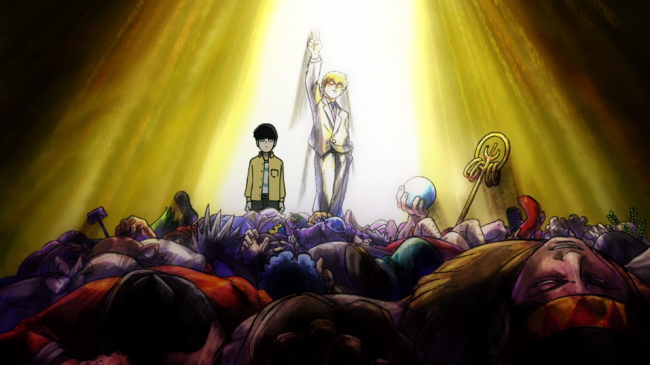 Posted on January 31, 2019 by WooderonPosted in Anime, Condensed Reviews:Tagged Anime, crunchyroll, episode 4, Inside ~Evil Spirit~, mob, Mob Psycho 100, Reigen.